In my experience, it has been a tremendous opportunity, and I would like to tell you more about what it is, how it works, and why it is a great opportunity. Like anything, there are no guarantees, but when there are no guarantees, there are often the biggest upsides for those who are willing to take the plunge. The beauty of this is that you can do this part-time (just like I have). In case you are wondering: “What is ‘Fulfillment by Amazon’?” Sometimes referred to as FBA, it’s basically a program where third party sellers send their stock (or inventory) of product into Amazon. The inventory goes into the Amazon warehouses (known as Fulfillment Centers). Then Amazon sells your products on Amazon.com. When they collect the money from the customer and subtract out a small commission and fulfillment fee for themselves, the third party seller earns the rest. Amazon also takes care of the logistics of sending out the product and they do it at very reasonable rates because of their enormous buying power with carriers like the postal service, UPS, and FedEx. Many people do not realize how many products are sold from third party sellers. Believe it or not, third party sellers represent about half of all product sold on Amazon.com. If you are not already selling on Amazon (especially using FBA), it’s a great way to grow a business and to get started in ecommerce. So let’s dive a little deeper and explore what this looks like it and how it might benefit those interested in starting an ecommerce business. Who Can Benefit from FBA? Established Brands – if you have an established brand, and you’re not on Amazon’s platform, this is a great way to get started with Amazon. Get your brand in front of people with very little extra work on your part since you already have your brand created. Online Sellers – whether you have your own product, or, you are a reseller of other products (perhaps you buy products wholesale, you fulfill and ship products yourself through your own website, eBay, etc), you could use FBA as a way of reaching a larger audience. Self-Starters and Aspiring Entrepreneurs – if you are looking to start an online business, this is a fantastic place to start up an ecommerce business business because so much of the heavy lifting and hard work is already done for you. Let's go into this a bit further. Trusted Platform – when customers buy something on Amazon, they know it’s going to be delivered and backed by arguably one of the most customer focused companies in existence. This platform has developed so much trust that millions of people are comfortable with having their credit card on file with Amazon. Industry Leading Review Platform – Think about this: have you ever been in a store and thought about purchasing something. Did you go on the Amazon app or website just to see what the reviews are before you buy it in the store? We’ve all done it or know people who have. many people will do it to see what actual customers are saying (i.e. “Is this a reputable product?). Personally, I’ll oftentimes research on Amazon just because it is such a trusted platform. And I knew, even before I started my own business, that so many people purchase on Amazon because of the level of trust. It’s almost a level of trust that I don’t think people see on other platforms anywhere else. Immediate Access to Customers – we are talking access to millions of customers. While I don’t know the exact number, it’s in the hundreds of millions of credit cards that are on file. You get the opportunity to partner your new or less-established brand with a very successful, very-established brand supported by millions and millions of customers. One-Click Buying Option – Think back to the times you purchased something on Amazon. Have you ever done “one-click buying”? If not, look into it. I’ve done this many times myself, where I am ready to buy something, so I click on it, barely having to think about it, and suddenly, the transaction has happened. I didn’t have to put in my address. I didn’t have to put in my credit card. It was all right there, conveniently on file. And that’s the way it is for those millions of customers. Convenience paired with access to customers equals sales for you. Customers love easy. Easier for You to Start Up – While not all of the work is done for you, a lot of the hard work is already done. If you don’t already have a product for sale and distribution, let me share with you what it looks like, as there is a lot involved in starting an ecommerce business (if you already have a product, then you will relate as I share this). In starting up, you will have to pick out the product – find something that’s going to be a good price, a good value proposition, and something that people would want to buy. So that’s all something you would have to do whether it’s FBA or your own website. But, if you’re doing your own website, you have to: build it from scratch or work with a template, drive traffic to it, find hosting for it, and find the domain. You will also have to do all the customer service. With FBA, a lot of that is already done for you. And remember, outside of FBA you have to house your inventory somewhere, and you will have to figure out how to ship purchased product to customers, but with FBA, all of that is already taken care of for you. It’s Cost-Effective – Over a billion year are shipped through Amazon – just at the holiday season. So each one of the items that’s being shipped from Amazon’s warehouse to the end customer represents a transaction for UPS, the postal service, or FedEx. This gives Amazon tremendous buying power. Therefore, they get the best possible rates, and as an FBA seller, you get access to great rates for shipping. Then they have enormous efficiencies because of their economies of scale which makes their labor for picking and packing products to ship to customers some of the best rates on fulfillment fees in the business. Step 1: Source Products – Let’s say you have 100 units of an item packaged and ready to sell. Amazon has a pretty simple labeling process, so you’ll add your barcoded labels and pack them to go to Amazon's fulfillment centers. Insider tip: make sure that you are not sourcing a restricted category. 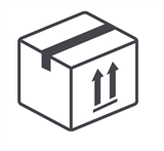 Step 3: Goes into the Amazon Warehouse – Your labeled product goes into the Amazon warehouse where it is securely stored and waits for a customer to purchase the product. Step 4: Customer Purchases Product – Amazon has millions of visitors, and ideally one comes to the website and purchases your product because you are fulfilling a need the customer has. Now this is there the fund begins. Step 5: Amazon Ships the Item to Customer – Their staff pulls the product from the shelves in their fulfillment center, boxes it up and ships it out to the end customer. The best part of this step is that it all happens in the background and requires absolutely no work on your part. 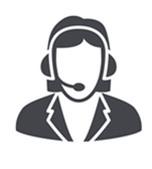 Step 6: Customer Service (if needed) – Now you will get inquiries and questions from customers from time to time. However, most issues are taken care of by Amazon. In the event of returns or questions about shipping, they handle it. Ideally, the end customer gets it and likes what they just purchased. However, if there is anything that goes awry, Amazon is going to go ahead and handle the customer service for you. So if there are returns, or if the customer has questions, those types of customer service are handled for you in most* cases. *Not all, but in most. It’s important to keep in mind that you still might have to deal with some questions and customer care but not most of it, which is a pretty nice perk. Remember, this happens 24 hours a day, and yet, it’s going to involve very little of your actual time. So basically, once you ship it to Amazon’s warehouse, they’re pretty much taking care of everything. Truly, it’s a fantastic program. I won’t use the word “hands-off” because you’ve still got to maintain your inventory, make sure your pricing is good, and do some marketing. While there are things you can, will have to, and will want to do in order to drive your results, for the most part, most of that hard work is already done for you with the FBA process. What are Some of the Costs Involved with FBA? Product costs – This goes without saying that you will have to pay for the products that you sell. Ideally, you want to shoot for about a third of anticipated selling price (or no more than 40%) to go towards the cost of the product. This is often referred to as Cost of Goods Sold (COGS). If possible, try to make sure that this includes the costs to ship product in, from another country. Shipping costs – You will need to ship the product to Amazon's warehouse. Personally, I import all of my private label products in to the United States and have them delivered to my home. With that being said, many sellers ship them in to a freight forwarder. Either way, as I mentioned earlier, the costs to ship products in to Amazon are extremely cost effective. I wish I could ship my personal Christmas gifts for those prices. Commissions – Note that the commission percentage will depend on the type of product and the category that it’s in. But, generally speaking, as a third party seller, most of the categories you’re going to sell in, you’ll most likely pay about a 15% commission to Amazon. Fulfillment Fees – These fees will be based on a variety of different factors (i.e. size of the product, weight of the product, etc.). You can check out their fee structure, and you will find their fees to be pretty reasonable. Individual Seller – this is someone who is probably selling less than 40 items per month. With that in mind, they are going to pay, in addition to whatever the fulfillment fee might be, an additional $0.99 per item sold as a fee. Professional Seller – this is someone who is confident he/she will sell 40 or more items per month. In this scenario and title (status? ), instead of paying the $0.99 per item you can pay a flat $39.99/month fee in addition to the declared fulfillment fee. The storage fees tend to go up significantly around the holidays because Amazon's fulfillment centers have a tendency to burst at the seems. In February and August, Amazon charges long term storage fees on items that have been in the fulfillment centers for more than six months, and the long term storage fees go up even more when the inventory has been in the fulfillment centers for more than a year. NOTE: I pay the Professional Seller amount, but I didn’t start off as a Professional Seller in the beginning. I started out as an Individual Seller, and then I eventually upgraded to the Professional Seller because it was worth my while (because I had grown my sales). It is better to get started, and build up! My advice: If you are unsure how to start, begin yourself as an Individual Seller; you can always upgrade later. There’s no sense paying $40/month unless you know you’re going to sell more than 40 items/month. If you have not already, register for an individual seller account. Do it now. Build up some momentum. I cannot stress how much little actions really do add up. 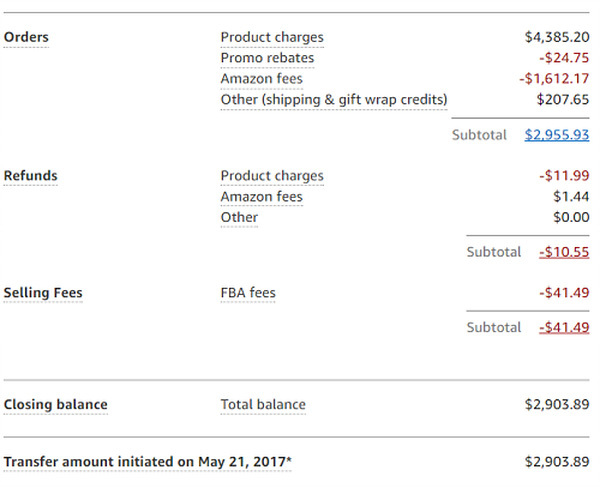 Every two weeks, you get a statement that shows the sales minus Amazon's fees they deduct. This is everything I listed above except the cost of the product. You take care of the product on the front end so essentially you are paying yourself back. Below is an example of a statement** with sales for a two week period and the associated fees deducted, and what is remaining is transferred to your bank account. I would say, you can look at about 1/3 of your selling price (more or less) is going to these fees and commissions, which is a pretty good deal if you really think about it. The traffic of people on their site that they’re going to bring to you is worth it alone. And when I say “traffic,” it’s not people browsing; it’s people who are ready to buy. People are going to Amazon because they’re looking to purchase a product, and, in most cases, they’ve already got their credit card on file. Amazon spends millions of dollars on their platform and marketing to bring people to the website, and you can get started by only paying them when they make a sale for you. How cool is that? This may seem a bit oversimplified, but there is no sense in overcomplicating either. Here is what you should do to get started. Step 1: Register a Seller Account – I’ve got the link here for registering for a Seller Account. My recommendation is to at least start as an Individual Seller. A little picture here on the right side of the screen is a picture from the Android App Store, very similar, of course, in the iPhone App Store. 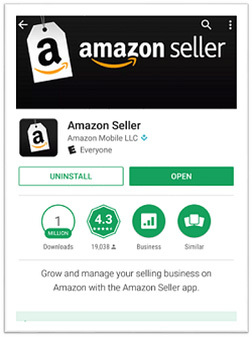 What I recommend is to download the app as soon as you register your seller account, take your phone to a store with the app open – maybe go around to the clearance aisle at Wal-Mart, Target, or wherever you wish – and you can start scanning items to see if it’s something that’s going to be profitable. And then check out the other features on the app. They’ve even got some nice trainings/training videos they can show you as well on the desktop website called Seller Central. But you can only access those, for the most part, once you register a seller account. There’s no harm in doing it. There’s no cost in doing it, to at least getting your account registered. Step 2: Find Products to Sell – Again, one option is to go around to clearance items. Or, you can do some wholesaling where you sell a product on behalf of someone else after setting up a relationship with a factory or distributor. Or, if you’re going to have your own product to sell, you can sell it through FBA, and you can get that product ready to go. You can see that you have a variety of options in getting yourself started with a product to sell. If you are interested, we have a video on our YouTube channel that discusses different product sourcing options. Step 3: Prepare for Shipment to Amazon – Amazon offers barcodes that they ask you to add to your product (you can print them onto labels and adhere). Or sometimes, you can actually use the existing UPC label/code on the product. And then, send those prepared items in to Amazon. Hopefully you’ve done your research and you’ve got everything at a good price – a market price – that people are willing to pay on Amazon. And you’re able to get what we call the “Buy Box”, which is that “Add to Cart” button. If you do that, you’re going to start seeing sales come in. Now it's time to send your shipments in. You'll need the right labels. I get my shipping labels and barcode labels on Amazon (both affiliate links), and have found these to be good quality labels at a good price (priced well below the name brands). Whatever you do, just get started. And I’ll tell you this – this doesn’t necessarily happen with everyone – but the first time that I went out and I found some items that were on the clearance section over at Walgreen’s, I shipped those items in. There were some that didn’t sell for quite a while, but then there were some that actually sold the first day, and I was hooked. I can’t even begin to tell you how elated I was, how excited I was. I think my wife thought I was crazy because I just went running into the room showing her on the Seller App that I made a sale. I was like, “Oh my God, I made a sale”. Once I made that first sale, I've been hooked on building this business ever sense, and I would love to see the same for you. If starting an ecommerce business sounds like something you are interested in doing, again, I would suggest registering a seller account TODAY. If you are already registered as seller, now it’s time find some products to sell. And if you already have products to sell, go ahead and ship them in, so that way, you can start seeing some sales on Amazon. Get that momentum going now! Thank you for stopping by, and I wish you the best as you work to maximize your ecommerce results!